Square Enix's upcoming card game sounds like it's going to make trading card game fans in Japan pretty happy when it comes out in February. Almost a month after it was first announced, Square Enix has revealed a lot more information about the trading card game that will be competing with the likes of Magic: The Gathering and Yu-Gi-Oh. 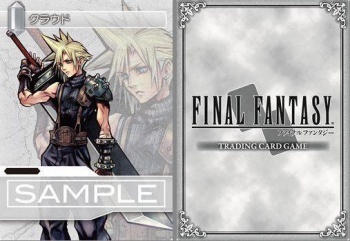 The game's basic information, that it's a one-on-one game featuring characters and summons from the Final Fantasy series, is already common knowledge; now, the publisher is explaining just how the card game will work. The basic card. These are used to attack and also block enemy forwards. These cards don't take part in battle. They provide the Crystal Points that are required for using cards, and also provide support to forward cards through abilities. These are used just once, but have powerful effects. The cards feature six basic elemental properties: earth, fire, ice, snow, water, and wind. On top of that, two other elemental attributes, light and darkness, will come into play. Additional details on these elements have yet to be revealed. The card game is coming to Japan on February 25. Square Enix is currently planning to sell the cards in booster packs of eight cards and starter decks of 50 cards (the starter decks will be sold in both Black and White themes, respectively). At the moment, there are 160 standard cards and 162 premium cards planned for the game, as well. Whether or not the game will come to territories outside of Japan remains to be seen.